Veteran journalist and author Joseph C. Goulden offers a good review in the Washington Times of Max Hasting's The Secret War: Spies, Ciphers And Guerrillas, 1939-1945. Such is due in large part to writers such as Sir Max, whose hard-eyed objectivity about war is a far cry from the “feel good” books from Stephen Ambrose and others. Mr. Hastings‘ 2011 work “Inferno” dealt with the brutality of war, and it is easily the best one-volume history of the war. 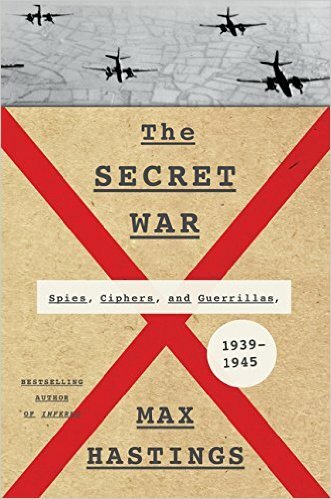 Now I must award Mr. Hastings another “best.” In a quarter-century of reviewing books on intelligence in these pages and elsewhere, “The Secret War” ranks foremost. His massive overview is a fascinating look at the dark world of espionage and dirty tricks that are a part of warfare, with terse and readable looks at spies, communications intercepts and guerrillas. He postulates some rules that should be heeded by modern masters of the dark arts: report what you find, not what you expect that superiors would like to hear. Further, in the end, intelligence is a sideshow to war — essential, to be sure, but in the end, battles are won by “great armies, fleets, air forces.” In other words, by brave persons who face the enemy directly.